I learned how to recane chairs over 20 years ago in order to restore my Great-Grandmother's nursing chair (left) and soon realised that my new-found skill was in demand. Since then I have added rush, Danish cord, seagrass and Lloyd loom repairs to my repertoire. 13 years ago I turned 10 years of experience into a business. 10 years ago my husband joined me in the business. 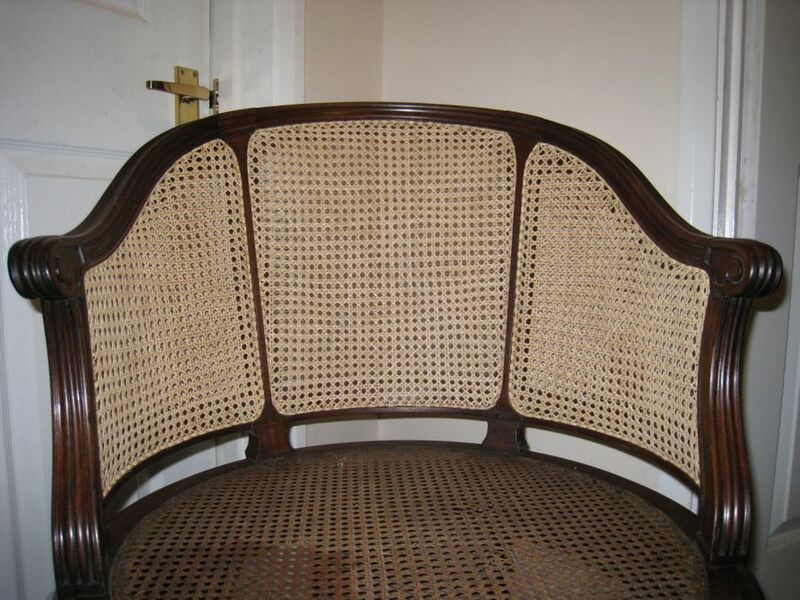 There are several different patterns used in caned furniture and we are able to copy whatever was originally on the chair or any other pattern required. There are many other patterns based on the snowflake. All are really only suitable for the backs of chairs or as a seat on a chair that is purely for decorative purposes. 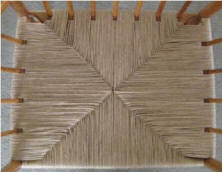 One of the most difficult shapes to weave correctly. All the doubles -fish heads to those from the US - are in the correct place and there are Xs all around the edge. This is before the beading strip has been fixed. Beading or binding strip in place and with a light staining. 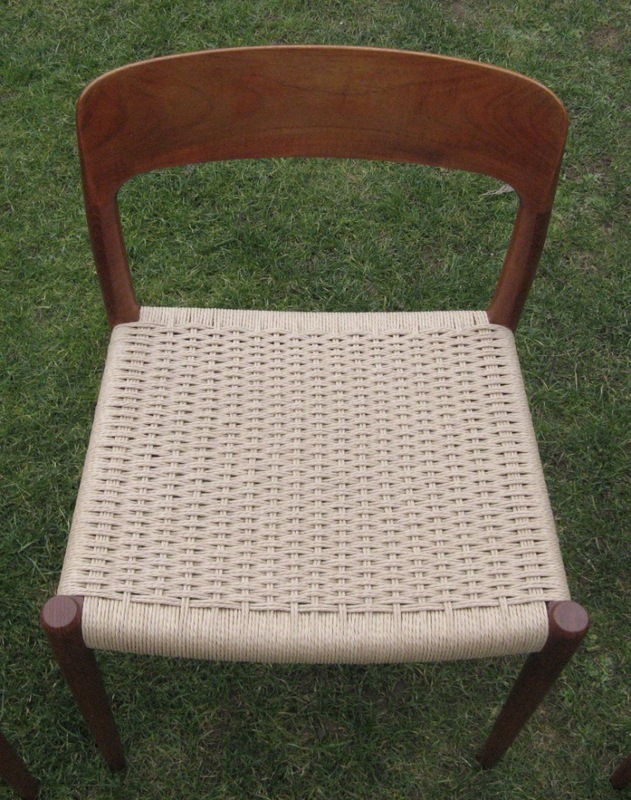 The size of cane on Thonet chairs is just the one size with the beading strip being the same size or only slightly wider. 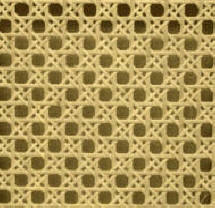 The beading strip is "couched" in every hole. 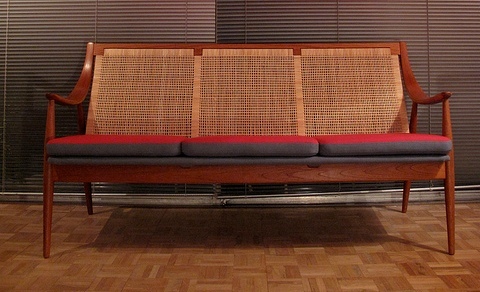 It tends to be just English furniture that is couched in alternate holes, as on the seat below. A useful piece of information: 'Thonet' is pronounced with a hard 'T' and to rhyme with bonnet. Michael Thonet was born, what is now Germany. Therefore his name is pronounced as in German and not French! The ER daisies have been woven because this is a chair used in the Coronation of Edward VII. See the For Sale page for details. Doubles in the holes below the short settings (verticals) and in the corner holes. Difference between laced and unlaced cord. 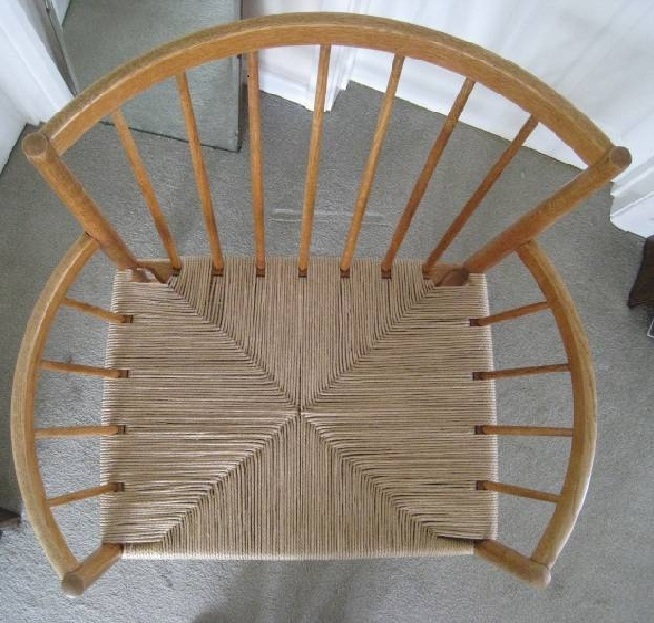 The original seating material on this rare J�rgen B�kmark chair is laced Danish cord, which is a tightly twisted 3ply paper cord of 4.5/5mm diameter. Unable to obtain this I had to replace it with a specially made 4.5mm unlaced Danish cord. It is this cord that is most commonly found on the well known Danish chairs designed by Hans Wegner and still made by the Carl Hansen company and others. We now have some laced cord in stock. The colour of Danish cord changed about 20 years ago. It used to have a yellow/goldy cast to it but is now a light beige. Sometimes the cord is looped over L shaped nails which are attached to the seat frame and sometimes the loops are stapled onto the frame. The former method is easier to re-cord and therefore slightly cheaper to replace. The normal state in which Danish cord chairs present themselves. This chair was made by J L Møller Design No 75 and the seating is a 3.5mm unlaced Danish cord. There is a very subtle curve to the back on two planes which makes the weaving a bit tricky. I found this image on the internet but not the designer. 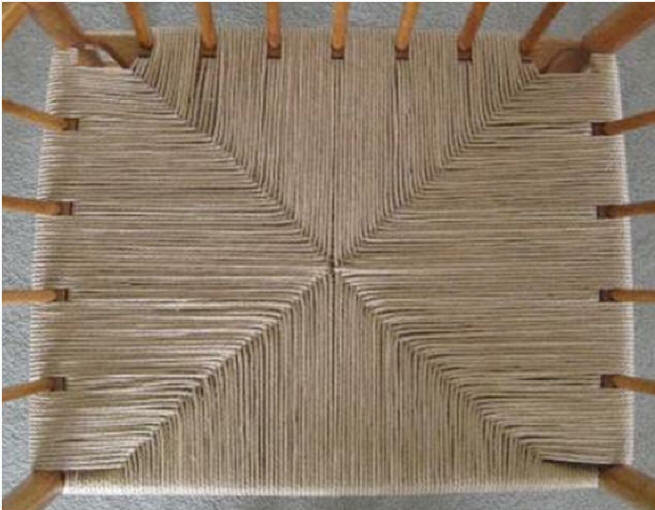 Each strand had to be stapled to the frame on one side before the strand from the other side was woven across and covered the staple. 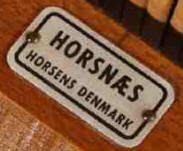 It is always good to have a look for the maker's mark. I found this on the bottom of the seat frame. 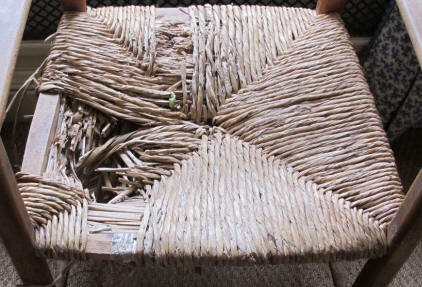 This is how the chair came to us The teak had really dried out and resembled the grey of old garden furniture. Amazing difference - with just a bit of Danish oil and lots of elbow grease. It really is the same chair! Just cleaned and oiled. 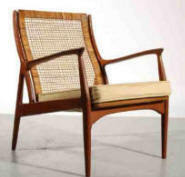 The arms are made of laminates of teak and beech. 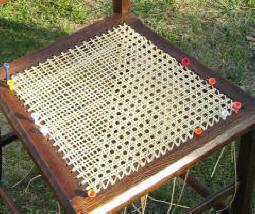 On this chair, each strand was wrapped several times over itself to secure it on the frame - no staples or glue. Not only featuring on 'Mad Men' but appearing as new on Dr No. Below is a very rare three seat version of the chair above. Apparently there are only 3 of these chairs in the country. The same chair with a new seat. The chair was sold by Augustus Greaves. 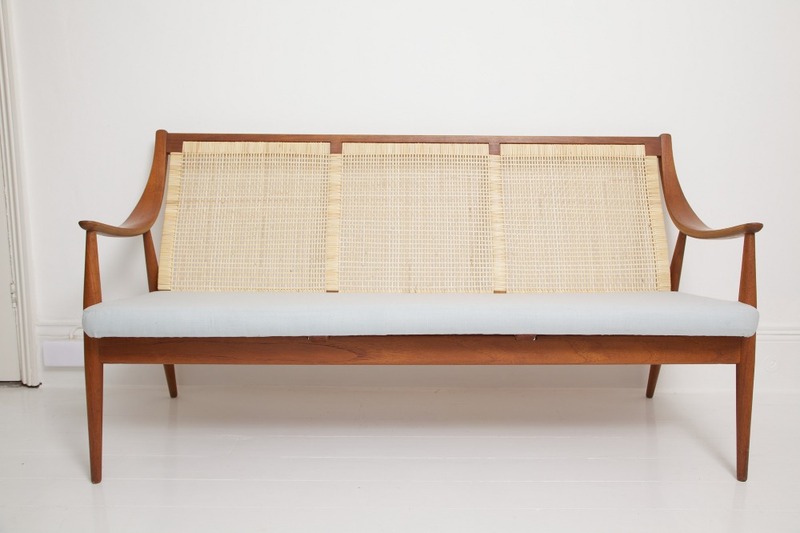 "The rattan has been expertly and renewed by a master caner. The amount of turns and spacing of the cane has been replicated exactly"
April 2013 - I have just finished a second one of these amazing sofas. That makes two out of three! 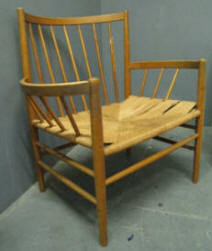 with some of my Danish chairs in our showroom at Glebe Farmhouse. I am only taking on a limited amount of rushing because of the strain on my old joints! The remains of the rush pattern shows that this pretty little child's chair is probably of Scandinavian origin. The colour of the rush changes as it dries. Eventually it will be a mellow goldy colour. 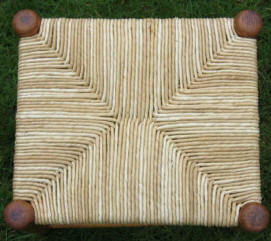 A lovely chair from Heals, freshly 'bottomed' with Thames rushes. This is a sedge grass wrapped with rye straw. One of the most difficult materials to use but well worth it. Sometimes one finds chairs with different colour wrappings giving a striped appearance. Very time consuming. Unfortunately this material has become very hard to find - unless you know where I can get hold of some!! The holes are not drilled all the way through the frame and each piece of cane has to be cut to fit the exact length and may have to be glued individually into each hole. Each piece of cane is glued in one hole then cut to length to go into the appropriate opposite hole. A smidgen of glue is applied before securing in the hole with a plastic golf tee or blunted nail. All the caning is glued in before the beading and couching can be done. 'Staples' of thicker cane are cut to fit from one hole to the next and then glued in. Fractionally thinner cane is bent double and a little glue applied before inserting in the holes to give the appearance of couching. This is the outside of the chair, you may be able to see that there is another layer of cane on the inside of the arm. This is 'double caning'. As with blind caning, it tends to be found on very high quality furniture. This desk chair is made by Mellier, who made much of the furniture on the Muritania. 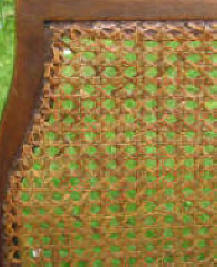 Riempie is a leather 'thonging' which we import from South Africa. It comes in two forms; white as shown below and raw. White is usually found on furniture from the 20th century onwards and raw on that which is older. Raw riempie is just like 'rawhide' and is excellent for using on canoe seats. We are the only people Europe that hold stocks of the genuine article! 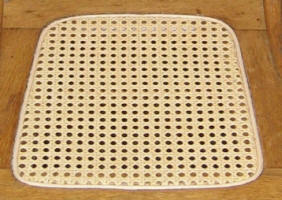 Riempie is surprisingly comfortable to sit on and is not intended to be used with a cushion. 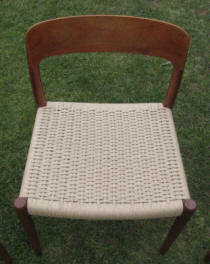 Regency chair with beautiful proportions. There is no beading strip around the edge of this chair because they were made to have a squab cushion. 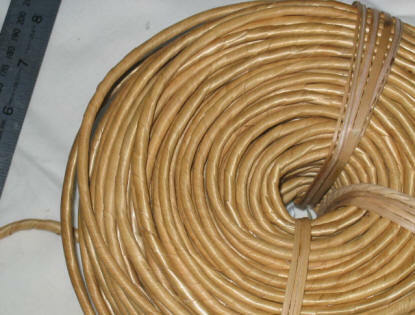 It is possible to patch a broken area of cane by splicing (weaving in) individual pieces of new cane and then staining to match the original. This is only financially viable where there is a large area of cane with a relatively small hole. 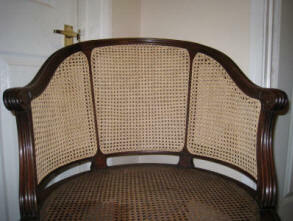 Here is a Bergère Chair showing the hole, the splicing in progress and the fully restored area. 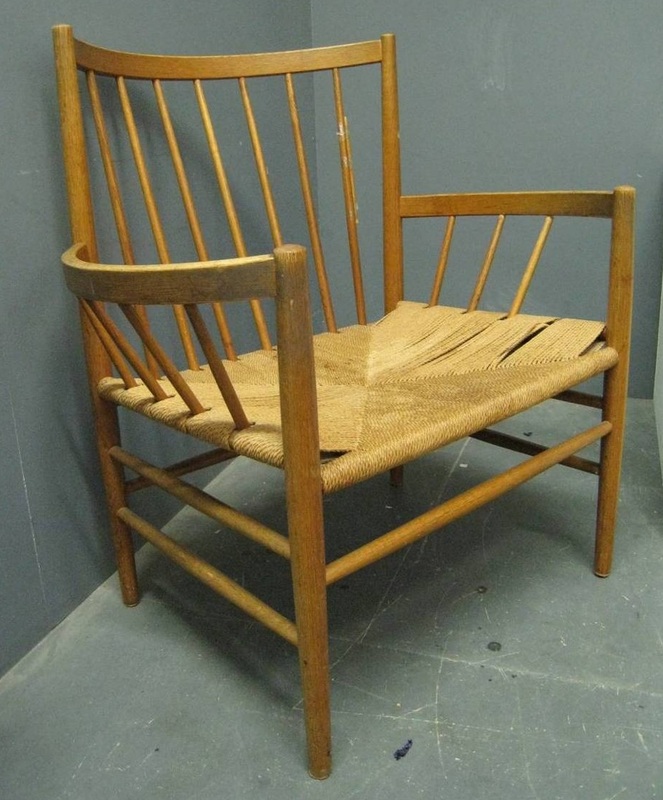 There has been a resurgence in the popularity of caned furniture in the past few years. 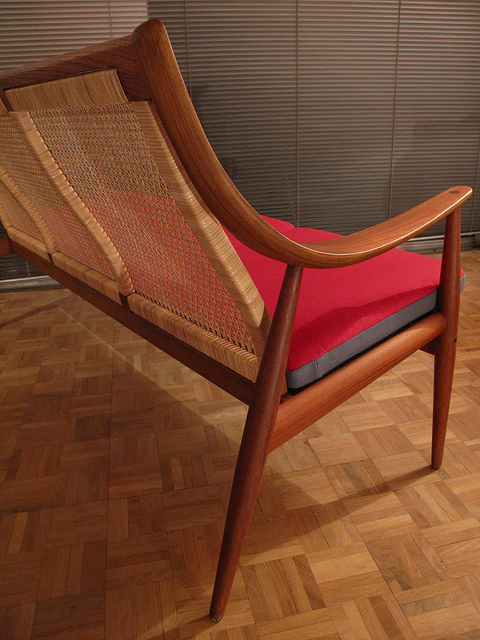 Prewoven or loom cane is used in most of this furniture. 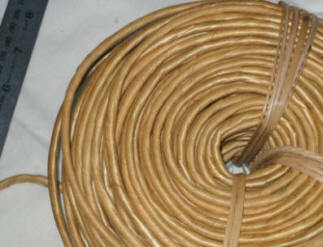 The most difficult and time consuming aspect of replacing this type of cane is the removal of the old cane. Sometimes it is stapled in the bottom of the groove, making it a very time consuming business.